When Jeff Bezos founded an online bookstore in 1994, no one could have guessed that in less than 15 years, Amazon would fundamentally reshape the U.S. retail landscape. No one, that is, except Bezos himself: As Brad Stone’s book about Amazon, “The Everything Store,” makes clear, Bezos’s goal from the start was to change the way Americans shop. Amazon’s remarkable rise carries two important lessons for economists: First, one ambitious, innovative company can have a huge impact not only on an industry but also on the economy as a whole. Today, Amazon employs more than 230,000 workers, a figure that doesn’t count thousands more who work as contractors in the company warehouses, sell products on its marketplace and rent out their labor on its “Amazon Mechanical Turk” platform. Amazon has contributed to the decline of entire industries — department stores, bookstores, movie rentals — while helping to create whole new ones. The second lesson: Amazon’s success was almost completely unpredictable, at least from the outside. To an economist looking at data on new ventures, Amazon was merely a bookseller, hardly a business known for its breakout growth even before the Internet upended the industry. And even if someone had looked more closely, what distinguished Amazon from Pets.com or Kozmo.com or any of the other high-flying startups that came crashing down to earth when the tech bubble burst in 2000? As a result of those lessons, policymakers concerned with entrepreneurship at both the local and national level have long favored what economist Robert Litan dubbed a “shots on goal” approach: Try to encourage as many startups as possible. Most of those companies will fail. Of the survivors, most will never grow into major economic engines. But statistically, a few will turn out to be the next Amazon, with huge rewards for their local economies. In research set to be published on Monday, however, a team of researchers at MIT argues that Amazon’s rise wasn’t so unpredictable after all. The researchers believe they have found a set of characteristics that can identify which companies have a shot at success. That could allow cities and states to move beyond the shots-on-goal approach and instead try to foster the specific types of companies that are most likely to create jobs and drive innovation. 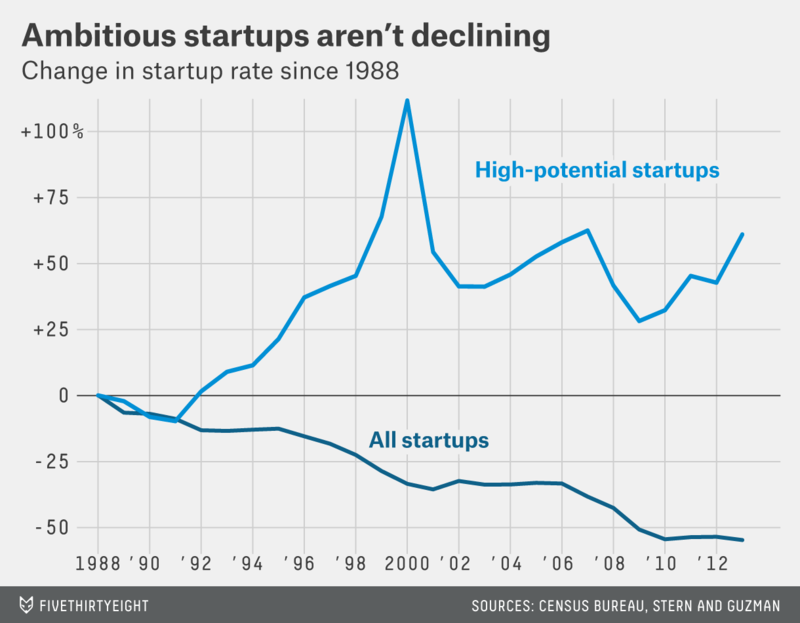 The new research comes amid a three-decade-long slump in U.S. entrepreneurship. In 1980, Americans started more than 450,000 new companies, according to data from the Census Bureau; in 2013, the most recent year for which data is available, there were just over 400,000 new companies even though the U.S. population is nearly 40 percent larger. The startup drop-off has corresponded with a decline in other measures of economic dynamism — Americans are changing jobs less often, for example, and are moving across the country less frequently — leading economists to worry that the U.S. as a whole has become more risk-averse. The new research, led by economists Scott Stern and Jorge Guzman, calls that narrative into question. Startups as a whole may be declining, they find, but the kind of entrepreneurship that economists care the most about — fast-growing, innovative companies like Amazon — hasn’t shown the same downward trend; in fact, in the past few years, those kinds of startups have surged in number. But all is not well. 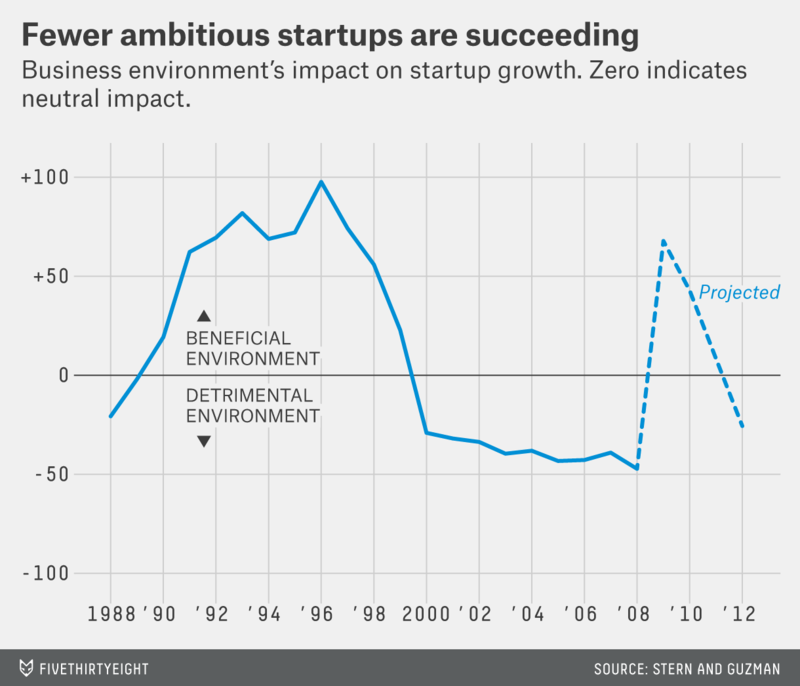 Stern and Guzman find that fewer of those ambitious startups are successfully becoming big companies. Put another way, the U.S. may have as many would-be Bezoses as ever, but it’s getting fewer Amazons. That finding is consistent with other recent research showing that even the most successful companies aren’t creating as many jobs as they used to. Together, the two trends suggest that the U.S.’s problem is less a failure to create enough new businesses and more a failure to help those businesses grow. Restarting that engine is key because historically, nearly a fifth of all new jobs each year have been created by new companies. Thanks to work by John Haltiwanger and others, economists have known for years that the benefits of startups largely stem from a relative handful of fast-growing companies. Many entrepreneurs, after all, don’t even want to be empire-builders. They want to be their own boss, or pursue a passion, or build a business they can pass on to their children. Others, however, set out from day one to create a major corporation. In theory, it is those ambitious companies that policymakers should be working the hardest to foster. The problem is that no one has known how to identify them. Stern and Guzman don’t claim they can predict which company will become the next Amazon, but they argue that it is possible to identify companies that are trying. They find that ambitious startups share certain qualities. Their names, for example, tend to be shorter and are less likely to include the founder’s name. They tend to be set up as corporations, not limited liability companies, and they are often incorporated in Delaware, a state known for its business-friendly regulations. They often apply for patents early in their corporate lives. By looking at those and other variables, Stern and Guzman calculate what they call an Entrepreneurial Quality Index — essentially a measure of how likely a new company is to achieve high growth. When it was founded, Amazon would have scored in the top 1 percent of all new companies on the index. “It’s very clear that Jeff Bezos’s intention was not to start a corner bookstore,” Stern said. Potential, however, is not the same as success. Stern and Guzman developed a second measure that looks at how many of these high-potential firms actually experience rapid growth. Their definition of success is narrow — they only count companies that either go public or sell for more than $10 million — but they argue that it lines up closely with traditional measures of corporate growth such as hiring. They find that in the 1990s, the national business climate was strongly positive — more new companies were succeeding than would be expected based on their quality alone. But for nearly the entire time since the dot-com bubble burst, the index has been negative. “There seems to be a pretty significant decline in the ability of high-quality firms to be able to realize high growth,” Stern said. Other evidence points in the same direction. A recent paper by Haltiwanger and others found that even the startups that do manage to grow aren’t adding jobs as quickly as they used to. The key shift appears to have taken place around 2000: Before that, overall entrepreneurship was declining, but the fastest-growing companies were still playing their usual role in driving job growth and innovation. After the stock market crash and recession of 2001, however, even those companies have been creating fewer jobs than they used to. “We’re just not getting the kick that we used to from high growth young firms,” Haltiwanger said. It isn’t clear why these companies aren’t growing the way they used to. One possibility is that these companies are succeeding on their own terms — making money, increasing sales — but aren’t having the kind of broader economic impact that they used to. Technology companies are often relatively small employers, at least compared with the big companies of the past. Facebook, for example, employs less than 13,000 people; U.S. Steel, which is a third smaller by revenue, employs two and a half times as many people. Much of Apple’s economic impact is in China, where the company and its contractors do most of their manufacturing. And Uber famously has thousands of drivers who don’t count as employees. But there is also evidence that the economy has become more hostile to new companies. Startups are failing at a higher rate than in the past, while older, larger businesses are increasingly dominating nearly every sector of the economy. Economists on both sides of the political spectrum have found evidence of increased “rent-seeking,” efforts by companies to use government regulation or other policies to protect themselves from competition. “There’s a whole range of developments on the regulatory side that have made life harder and more challenging for newer and young businesses,” said Steven Davis, a University of Chicago economist who has studied the decline in entrepreneurship. Whatever the source of the problem, it hasn’t affected all parts of the country equally. Stern and Guzman used business-registration data from 15 states to calculate both quality and success indexes for different metro areas. Some, like Silicon Valley, showed both high rates of entrepreneurship and successful growth. Others, like Miami, have seen a steep drop in the number of high-potential startups in recent years. Perhaps not coincidentally, cities with high rates of startup activity have also experienced faster economic growth over the past decade. Fazio, who runs the Laboratory for Innovation Science and Policy at MIT and co-authored a policy brief based on Stern and Guzman’s research, said she hopes regional and national leaders will be able to use these new measures to figure out what policies work in promoting entrepreneurship and to more precisely identify the challenges in their communities. The shots-on-goal approach made sense in the past, Fazio said, but the new research should allow for much more finely tuned policies. Policymakers shouldn’t abandon efforts to help those less ambitious startups, Fazio added. Low-growth businesses — restaurants, construction companies, landscaping firms — are a key source of upward mobility for immigrants and low-income workers, and they play an important, if harder to measure, role in making communities vibrant and livable. But the policies that help a local chef start her own restaurant aren’t likely to be the same ones that help foster the next Amazon or Google. What are those policies? Fazio pointed to work by Karen Mills, the former head of the Small Business Administration and now a fellow at Harvard Business School, who in an essay last year laid out a range of policies — from entrepreneurship classes to business incubators to subsidized loans — to help communities promote different kinds of entrepreneurship. But such research is still in its nascent stages. What Stern and Guzman’s data allows for is a more clear recognition of the problem that needs to be solved. In this chart, the “all startups” line refers to the number of new companies founded each year as a share of gross domestic product. The “high-potential startups” line is a bit more complicated. It shows what Stern and Guzman call the Regional Entrepreneurship Cohort Potential Index, also as a share of GDP. The index essentially looks at a group of companies and estimates how many of them are “high potential,” meaning they would be expected to grow, which Stern and Guzman define as either going public or being sold for more than $10 million. Both lines are shown as percentage change since 1988.